The colors on the Intersection graph shown here are a graphical representation of the numbers that you see to the left of the graph. Let’s take a look at the Competing Domains report for Ahrefs.com as an example. We can see that Ahrefs.com ranks for 23,714 unique keywords in comparison to Backlinko.com. At the same time, Backlinko.com has 29,219 unique keywords, that Ahrefs doesn’t rank for, while they both share 6,605 common keywords. These 6,605 keywords constitute 11% out of the total number of keywords that Ahrefs.com and Backlinko.com each has uniquely and share in common. Correspondingly, the Intersection graph we see next to them represents these numbers percentage-wise. The blue color on the graph represents the unique keywords that only Ahrefs ranks for, while the yellow color represents those that only Backlinko ranks for. 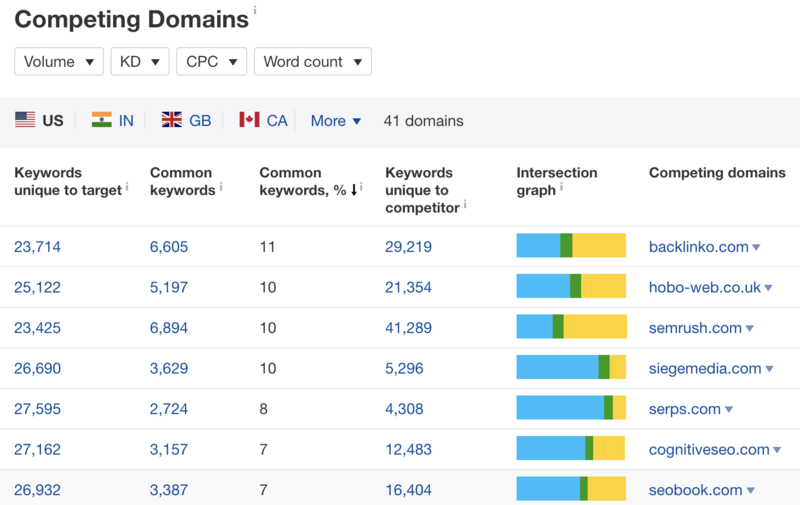 The green part between them represents the intersection between the blue (keywords unique to your target website) and yellow (keywords unique to your competitor) bars.